For the convenience of C.O.B.R.A. Defense Miami visitors we’ve mobilized the website using a mobile app. This is cutting edge state of the art technology that turns the website into a mobile app. A mobile web app offers you a very high level of convenience allowing you to navigate the website quickly and find the information you need using a common mobile app interface. Beacuse it’s built using advanced technical mobile features it also offers functions not found on the desktop, or laptop version of the website. You can download the C.O.B.R.A Mobile app from the Google, or Apple app stores for your phone, or tablet device. 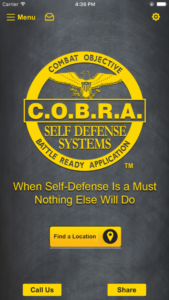 As soon as you come to http://cobradefensemiami.com you’ll see something like the screenshot to the right on your phone. As you can see there are three small buttons on the top and normal looking mobile tabs below. We’ve placed these features on the home screen as the bare essential set of facts for anyone new to C.O.B.R.A. Defense programs and classes. Read all about our different classes and instructors. Get a map view that you can share with others. Share the app with others. From the More Tab on the home screen there are more features you can discover if you have the time and the inclinations. C.O.B.R.A. Gold Video Nuggests: This will take you directely to the C.O.B.R.A. Defense YouTuibe channel. On our YouTube channel you’ll find a number of short self-defense video training tips that you can use to get a feel for what C.O.B.R.A Defense Miami is all about. C.O.B.R.A. Class Photos: Find a collection of 30 or so photos from a recent C.O.B.R.A. class. You can get a flavor for how interactive our classes are. They’re hands on with a focus on providing practical self-defense skills you can use. Social C.O.B.R.A. – A collection of links to C.O.B.R.A. Defense Miami on Facebook, Google + and Twitter. C.O.B.R.A. Fans: This is what is called a Fan Wall. 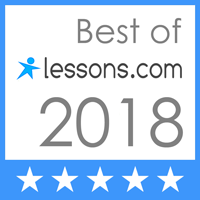 If you’ve gone throught the training or just want to show your appreciation for the web app or just say hi, this is the place to do it. Check in and let us know what’s up in your world. C.O.B.R.A. Blog: the world of self-defense is dynamic. Check out the blog for articles that are all designed to keep you informed so you can feel confident and secure about keeping yourself and our family safe.